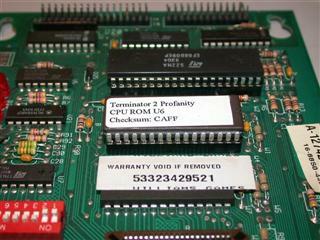 Please note: installing updated eprom chips in your game WILL wipe out any high scores or game customizations. Be prepared to change any settings (enabling Free Play mode etc) when you replace the chips. 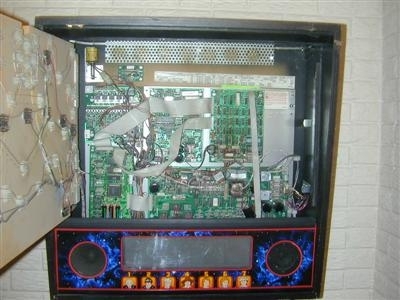 Unlock and remove the back-glass from your machine. 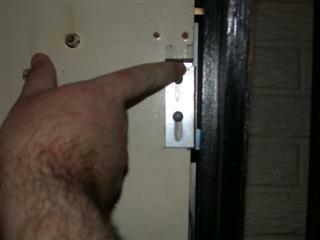 Your machine should have keys for the back-glass lock, most always put on a hook inside the coin door. Make sure you ground yourself on a grounded part of the machine, be it a side rail, ground strap etc. Unlatch and swing the light insert board open. Behind the light board, you will see the circuit boards that control your pinball. The one to the lower left with the 3 AA batteries is the CPU. 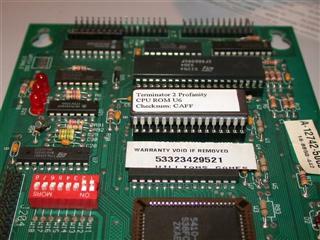 This photo shows the eprom in the socket from the side. 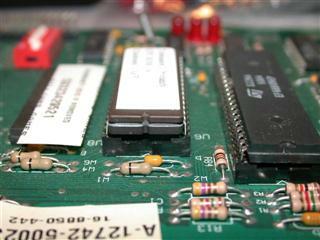 When you remove the eproms, it is important that your small flat head screwdriver is placed between the socket and the eprom, not the socket and the board. Prying the socket off of the board can do serious damage to the board, requiring expensive repair work.This photo also shows in closer form what the notch on the chip looks like. 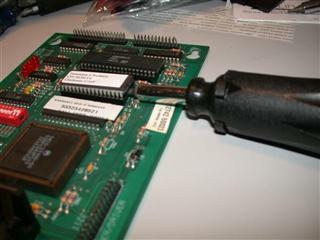 Using your small flat-blade screwdriver, insert the tip between the eprom and the socket, and pry slightly, just enough to start to remove the chip from the socket. Alternate between the sides of the chip until the chip is out of the socket. It is important to do this slowly in small increments so you do not bend the legs of the chip. Place the removed chip carefully aside, perhaps in the anti-static tube your replacement chip is shipped in. In this photo, the socket is empty and ready for the new eprom. Carefully remove your updated chip from the anti-static foam it was shipped in, and verify it is the correct chip for the socket (same number of legs, same shape and size etc)Line up the chip, noting the notch is toward the right. The easiest way to line the legs up is to line up one side of the chip without inserting the pins into the socket, and gently roll the chip toward the board until the legs are lined up for both sides of the socket. Once the chip is lined up, apply gentile pressure to the chip, slowly pushing it into the socket. This photo shows the new chip installed, nice and snug in its socket. Take a closer look, and make sure no legs are rolled under the chip, or hanging outside the socket. 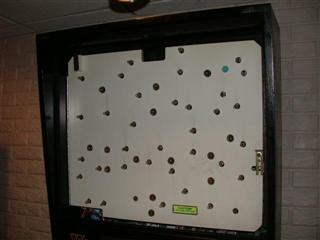 If so, you could damage the chip and the board when you turn the game on. The legs of the chip are delicate, and are easily damaged with improper handling. Removing chips with flat blade does work - but sometimes if other components are in the way it can be tricky. Just bought this one from ebay: http://www.ebay.co.uk/itm/IC-INTEGRATED-CIRCUIT-CHIP-INSERTION-EXTRACTION-TOOL-HIGH-QUALITY-NEW-/290834539292?_trksid=p5197.m1992&_trkparms=aid=111000&algo=REC.CURRENT&ao=1&asc=14&meid=4802127541685881041&pid=100015&prg=1006&rk=1&sd=290834539292& which is a whole 30p cheaper and hopefully wont break. Nice tool to play with but expensive...........could buy a lot of Scooby-snack for that ! 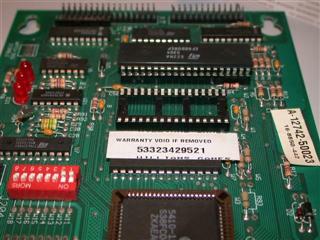 Please please please please use proper IC pullers for removing ROM chips like this! It's alright playing fast and loose with a screwdriver if you are buying blank chips in tubes from Farnell and you can burn your own ROMs onto the chips - therefore one or two broken legs is not a problem - but especially on older electronics where there is definite risk of battery corrosion, general dirt, dust, debris... you will need enough force to remove the chips whereby you can very easily put a lot of force into a chip, and then have it 'break' free of rust + grime and all of a sudden, you've levered the legs off. If you can't easily or cheaply replace the ROMs yourself, spend the few quid on even the tweezer-like pullers - it's worth it in the long run.